What kind of peanuts are these? I finally went for it – I bought raw peanuts at the farmers market. For a few weeks I have been passing them by, watching the folks pick at them, selecting each nut one-by-one. Unsure of how they cooked them and a little afraid the rawness would get me sick. Then I bought some and they are amazing – like no other peanut I’ve ever tried before. This happens a lot at the farmers market and is part of the joy of shopping there. Buying something new and learning how to prepare it. Learning that it tastes nothing like the stuff in supermarkets, and having your entire concept of something shattered. Which always leaves me asking – just what are they selling in supermarkets? These peanuts are big and soft, white and oily. The taste is much the same as a store-bought peanut, only a little sweeter. The difference comes in the potency of each nut – so packed with nutrients that I can only eat a few. Have a handful and it’s like a full meal. My stomach gets an instant burst of energy. And what a difference quality makes. I’ve heard for years that peanuts are an excellent source of many nutrients, including protein. But not until I tasted fresh, local ones did I fully understand their strength. Wikipedia says they contain over 30 nutrients and WHFoods says they can help fight everything from heart disease to cancer and Alzheimer’s. Of course, that all depends on the quality of the peanut. And now that I’ve tasted these I will never look at ballpark peanuts the same way again. Not to mention supermarket peanut butter. To prepare them, I spread them on a pan and bake for 30 minutes at 350 degrees – shuffling them around at the halfway point. Do you have a better recipe for preparing peanuts? – Please share in the comments. It turns out that a peanut is a bean – a member of the legume family – and not a nut. It has many names across the world, including “goober” and “monkey nut”. It’s a small plant that grows 1-2 feet tall and produces flowers which grows just long enough to fall to the ground. It then buries itself underground and turns into a peanut. The peanut is new to the world having been discovered in the New World and quickly spread across the globe – notably to Africa, China and India. The last two growing 60% of world peanuts which they don’t export, nearly all are consumed at home. 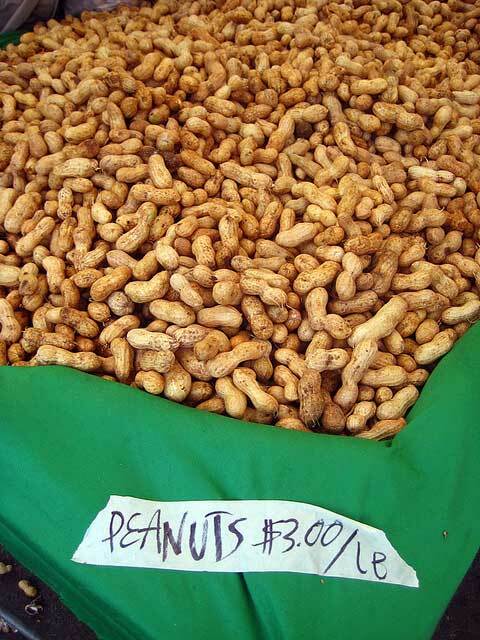 The United States is the world leader in peanut exports. I love to eat boiled peanuts, I’ve only found them in the deep south, Florida at a farmers market and outside of New Orleans, boiled in cajun spices. If you haven’t tried them, they will be a new treat! Vallery – thanks for the tip. I will definitely try some boiled peanuts this weekend. Tomorrow is my weekly run to the market. I boil raw green peanuts (which are the kind you have pictured). I usually find these little gems in Asian Markets. Peanuts are delicious when prepared in this old Southern way. Just wash the peanuts with plenty of water to make sure all the dirt is rinsed off. Then add as many peanuts to the pot as you can. Then add water and plenty of salt. (Most recipes call for as much as 1/2 cup — you use less according to taste.) Cook for several hours, depending on how dry the peanuts are. Some people let them sit a while in the brine after cooking, then reheat. This helps the nuts absorb more of the briney flavor. Some people add other flavoring to the cooking water — Cajun spices. teriaki flavors, garlic and onion, Old Bay seasoning, etc. The final product tastes way different than you would ever expect a peanut to taste. Here is more information — enjoy! Great tips Alicia. I like the idea of adding spices to the boil. I will have to look in my cabinet to see what I have. Next Next post: Toxicology ratings of smartphones – how toxic is your phone?